Pumpkin seed oil is obtained from seeds of pumpkin scientifically known as Cucurbita pepo plant, mainly grown in Styria. Pumpkin seed oil contains many health boosting nutrients. 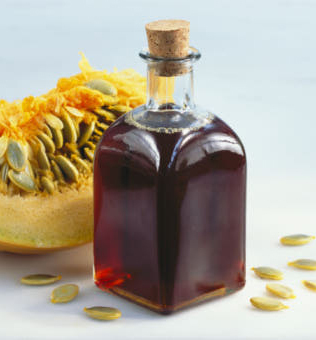 Pumpkin seed oil is extracted from seeds of Cucurbita plant through solvent extraction, using supercritical CO2 or through regular cold press method. Cold pressed method yields less oil from seeds but this is the only healthy oil while other ones contains harmful chemicals. Pumpkin seed oil thick, turbid and oil needs filtration to reduce its turbidity. Pumpkin seed oil varies from dark green to brown in colour, in thinner layers, it looks dark, bright green and in thick layers, it looks clear red. It has nutty flavor. Pumpkin seed oil is a highly unsaturated oil with predominantly oleic and linoleic acids and very long chain of fatty acids. It has anti-hypertensive property, helps to lower blood pressure. It can protect cardiovascular system from disease. It contains many free radical scavenging nutrients. It shows strong diuretic effects, reduces pressure on bladder, and promotes release of excess stored body water in body through increased urination. It has galactagogue property, it increases mother’s milk production. It provide relieve to reduce inflammation because of powerful essential fatty acids. It aids body in killing and expelling intestinal worms. It helps in insomnia because of tryptophan in the seed oil, May help one fall asleep faster. It has anti-inflammatory property as it reduces inflammation all over body. It boosts the health of prostrate and protects it from benign prostatic hyperplasia (BPH). It helps in moisturizes skin, boosts skin health, promotes better functioning and it works against fluid buildup in body. It helps for relieving pain caused by arthritis. There is no known adverse effects of pumpkin seed oil. One should make sure that the pumpkin seed oil is cold pressed. Other kinds of pumpkin seed oils are harmful and may even contain carcinogenic compounds and toxic impurities. As it has antioxidant properties, it can serve to lower blood pressure, so should consult with health care before using in conjunction with hypertension medication to discuss risks and potential complications.